On sale! (normally $319) Transform music into light with the Nanoleaf Rhythm. Plug it in, turn it on, and embark on a sensory adventure personalised just for you. Introducing the Nanoleaf Rhythm, a smart lighting product designed to help you light up your life your way. Watch your Nanoleaf light panels dance to music with the sleek Rhythm module! 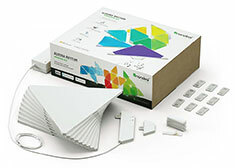 No wires, simply plug the module into any of the Nanoleaf light panels and see it react to music in real-time. In addition to customising within the app, you can also toggle through saved Rhythm Scenes via its built-in button.